Fruit growing areas and zones will move as the climate changes. While the debate about global warming is hot and heavy, it is unclear what kinds of effects it will have on backyard fruit growing. When Grandpa shoots the breeze in the coffee shop with the other old timers, we all seem to agree that the old winters and summers we used to have when we were younger seem a lot different than what they are now. Perhaps it is because there is “global warming” or perhaps it’s because the weather seems to run in longer cycles. It’s definitely not the cycles we were used to a generation ago. At least we all agreed that kids nowadays don’t seem to have to walk uphill both ways to school in blizzards anymore. Grandpa has been around long enough to know that cold events (like what we had in the winter of 2013-2014) seem to come about every 20 years or so. The peach industry in Michigan typically gets hammered by a cold event in this frequency. In 1972, Grandpa was in Basic Training in Ft. Ord, CA while at home, my father, the original “Grandpa”, sat through several days of a -20F arctic blast that picked the peach crop that year. Back home in the spring, I saw only a few peach blooms on limbs which had been buried under deep snow drifts. In the early 1990s, another cold weather event devastated the peach industry here. 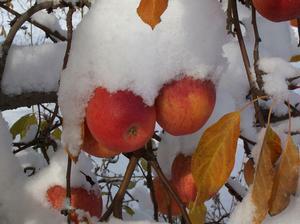 In the 2013-2014 winters, some areas were hurt severely enough to have to remove dying orchards. While just 20 miles away, other parts lost just some crops and had little tree damage. It seems that each part of the country has its own particular cycles. What “global warming” will do to these cycles remains to be seen. However, I suspect that we will still be able to grow fruit in most places as long as your orchards are planted on a site where it can be protected from severe frost in the spring. Perhaps over time, the climate will change so much that people will actually be able to raise peaches in Minnesota. But it won’t be next year! There was a neighboring farmer by the name of Jim Friday, the breeder of the Stellar Peach varieties, who stood up at a meeting I attended to make a comment. I don’t remember the actual comment, but I do remember him prefacing his by stating that he came from the “banana belt” of Michigan, Berrien County. We can raise so many different types of crops here. Well, we have never been able to raise bananas here, but perhaps in the far future there is hope. ← Cleaning up the orchard.